Content curation for learning is very much in vogue these days. However, the process of finding, aggregating and selecting relevant content has always been a key skill in learning design. As the web has developed and the volume of content has grown these content curation skills are arguably becoming more important. In particular, we need the ability to filter the huge volumes of new content prior to evaluating, selecting and adding value to content. The growth in content volumes and constantly changing information is one of the reasons that Robin Good believes curation is poised to transform learning. The pace of change these days means that L&D staff simply can’t create all the content that learners require. The good news is there is a huge amount of content readily available on the web that can be accessed and made available to support learners. Let’s look at what it takes to be a great content curator for learning, and some resources that can help you. Aggregation: seeking out and bringing content together. Distillation: identifying the most relevant and the important content. Mashups: the bringing together of curated content to produce a new viewpoint or perspective. Chronology: providing content by date to show how a topic is evolving. In many ways this curation skillset and process is very similar to the Seek > Sense > Share model that Harold Jarche has developed. Harold’s model is designed around personal knowledge mastery but similar principles apply to teams or groups. The ability to find and filter content aligns well with the Seek stage of Harold’s model. The grading and synthesising aligns with the Sense stage and whilst there are differences the curator’s role in contributing and signposting are similar to the Share stage of the model where ideas, resources and experiences are shared. In the ‘find and filter’ or ‘seek’ stage of the process, content curators can and should use automated processes. This is where curation as a skillset has changed in recent years. You simply can’t find and read everything manually, whereas crawlers and algorithms can. Our Anders Pink app and algorithm for example can review over 8 million posts published today. The key skill is being able to use automated processes to aggregate and filter relevant content. In simple terms it is the difference between someone who can enter a search term into Google and someone that understands the importance of advanced search and filtering, and can use this to bring back much more relevant content. You can use an automated tool such as Google to find authoritative content on elearning or you can use RSS feeds, for example from a site such as Elearning Industry to see all new content they publish. Both of these are very crude and simple ways to find content. Search engine results as Robin Good points out are strongly influenced by brands and commercial considerations, including placing ad content above search results. By using automated and advanced search features you can refine your filters to find the content you need. In the case of Anders Pink you can specify a topic such as elearning and the crawlers and algorithm will find and filter for you all the latest articles published each day on elearning. However, the skill of a curator is to go further. For example, you can use keyword combinations to only filter content about elearning trends or say game based elearning design. The curator can further refine their automated curation to filter content just from specific domains they trust or RSS feeds or even just what experts in the field are sharing. In this way the curator can use automation effectively in the find and filter stage. For curation, less is more. Anyone can use Google and get 2 million results. That’s not curation. You want to find and filter quality articles that are highly relevant for your audience. Currently automated tools are best at aggregating and filtering. However, developments in machine learning and AI means they are beginning to add value beyond aggregation and filtering. For example, they can look at factors such as how many shares the articles received, and more specifically the algorithms can look at how many of your network or your team shared the articles. They can also review how many upvoted the article or commented on the article. Algorithms can also look at the author of an article and the authority of the domain the article was published on. In this way algorithms can help determine if an article is more likely to be relevant and of interest to you. A good curator can use these factors to further refine the automation of content. However, automation, whilst essential to good curation, still only takes you so far at the current time but can be helpful in the initial grading and synthesising of content. Machines find, aggregate and filter. Curation needs a human touch. Pinterest is a great example of manually curated content. Users of Pinterest find and share pictures, blogs and other content and collate these on their own ‘pinboards’, which acts as a personalised curation of content. Users can browse the content of users and save individual pins to their own boards. Typically a user’s board is organised around a central topic or theme. Each board is very personalised, it is what the curator wants to share with their audience. Good curators add value to the content. You know what it’s like when someone sends you a link in an email with a “interesting” comment. It’s not very useful. We need to go further. In simple terms this might just be a comment on why is it important. Curators can also provide context. An article may not seem relevant but the curator can explain why it relates to a specific project or development, or a specific team. As Jan Sykes (2013) says “the value of your curated content lies not only in the material selected but also in the timeliness, order of importance indicated for content items chosen, and analysis you add.” Curation means adding your voice and opinion on why this content matters. It’s about sparking engagement with the audience. It is important for learners in many areas to stay updated with industry news. This might be new products, competitor developments, acquisitions or new research findings. What was the latest new in your industry yesterday or this morning? Nobody realistically has time to check 50 sources to stay up to speed. Industry news lends itself well to aggregation. In my view whilst you can curate and pick out the most important news sometimes it is important to be able to scan or skim headlines from across the industry. This can give you a very good overview of the issues being discussed, even without diving in to read the articles themselves. Sometimes it is enough to know you’re not missing anything vital. There is always a balance to be struck when curating content. On many occasions less is more, just give me the important relevant content. However, when it comes to news I think it can be useful to see more and to scan headlines to get an overview. The world doesn’t stand still. Occasionally there are major steps forward in industry best practice but most of the time it is small, incremental improvements that improve performance over time. In most industries there are new case studies, new tools, and new tips every week. Curating these articles into a single briefing or aggregation can be a useful way of prompting learners to reflect on what they are doing and how they can improve. This type of content can specifically supplement formal course materials with latest examples and tips. Here is an example of an automated curation of the latest articles on copywriting tips, which has not been manually curated; and here is an example of my manually curated best articles on startup strategy advice. One of the roles of a curator is to evaluate, sense and elevate content. The curator through the curation process is able to see significant or important trends and topics. Thus they can add value to learners by setting up specific curations around these topics or trends. These curations can add value to formal courses by covering new topic areas and trends that were not covered in a course or only covered in a limited way. 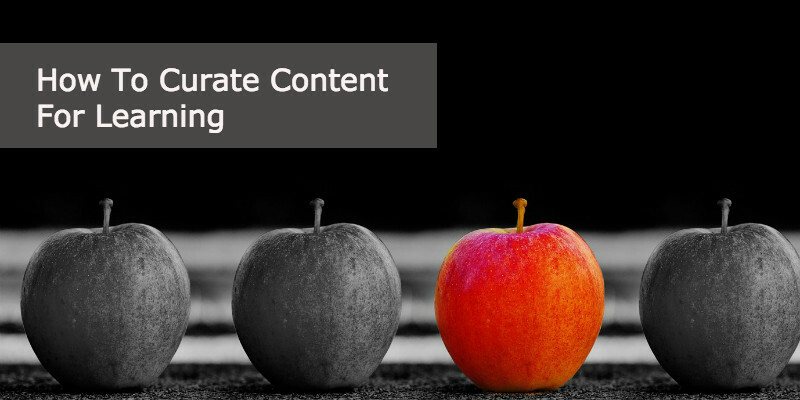 Here is an automated aggregation and filter of the latest articles on content marketing trends and here is a manual curation of articles on developments in the elearning market. These curations can be used as the basis for discussions and also to prompt reviews of formal course material. The key here is where you place the curated content. Ideally it should be as close to your formal content as possible. One way is to embed curated content directly into your Learning Management System or Learning Platform. Our plugin for Moodle and Totara LMS lets you do this. Keeping this content alongside your formal courses and blends increases the likelihood that learners will discover it, rather than sending them to another platform. Content Curation is as important a skill to L&D as learning design. In many ways, it is a form of learning design. We’d love to hear how you’re including curation in your approach to help learners stay informed.